Jordan Brand is expected to make huge waves this December with their Holiday Collection 2011, which includes a new edition of the Jordan 1 Flight. 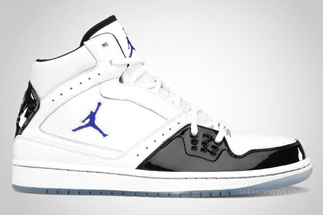 The Jordan 1 Flight will be coming out in White/Black – Bright Concord – Metallic Silver colourway, which features a white upper part with black touches. It sits on a white midsole and metallic silver outsole. This is arguably one of the best edition of this model so make sure to grab one and you will definitely get your money’s worth!